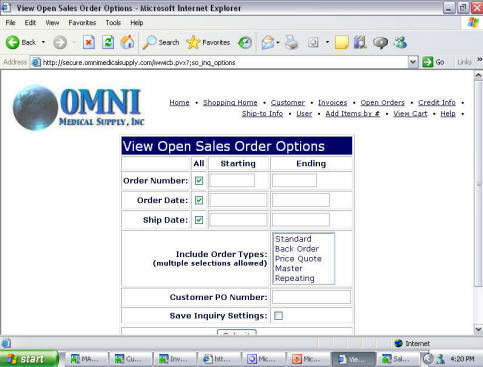 nAs an Omni Medical Supply customer you have access to all of your current open orders, price quotes and backorders. These may be searched by sales order number or your PO number. nEnter the selection criteria and click submit. The order numbers that appear will be linked to the detail line items for that specific order, and available to be viewed. nFrom the detail line items screen you can add all the items from the open order to your current order by selecting “Add all items to shopping cart” (This will eliminate having to re-enter frequently used item numbers) Delete any items you do not wish to order.